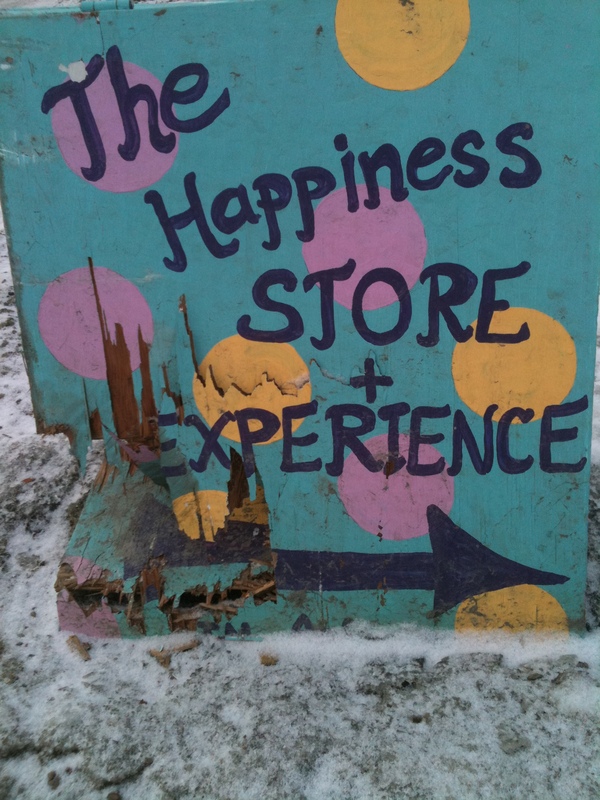 Last week, my Happiness Paradigm sign was the victim of a hit-and-run accident. Hardly a tragedy. Still, my internal demons flared up in sadness that my handiwork was destroyed; anger at the person who did this; and resentment that I had to make a new sign. As you can see, the carnage was not inviting. Where is happiness in this situation? First, in mindfulness. Thanks in part to my mediation training, I could analyze my role in what happened (putting the sign too close to the road, for example). I find it easier to acknowledge one’s own responsibility, rather than simply blaming the other. This was also a good opportunity for self-reflection — why did those particular emotions flare up?? — and therefore, personal growth. Second, in gratitude. My son Ben is a gifted carpenter. He quickly and efficiently measured, cut, and primed a (recycled) piece of wood for me to use — making the new sign task much less onerous. I am thankful for his help. Third, compassion. After focusing a loving kindness mediation on the person who did this, I realized that he/she might not even know it happened. In any case, I was able to let the anger slip away — and happy to see it go! BTW, if you’d like to try for yourself, there are many examples of Loving Kindness Meditation on YouTube. Fourth, the episode illustrated how expectations can breed unhappiness. It brought to mind the first presentation I attended on Gross National Happiness and Ecological Economics. Writer/professor Eric Zencey impressed me with his discussion of “entropy” — the inevitable and steady deterioration of a system or society. Of course, my sign “deteriorated” rapidly! Still, happiness lies in letting go of any expectation that things will stay as they are. However, expectations do have a positive role to play in happiness. The same day my sign got trashed, I reserved a lake front cabin in Maine for vacation. Planning the trip and looking at online photos gave me an appreciable happiness boost. According to a February 18 2010 article by Tara Parker-Pope in The New York Times, this is no surprise. She shared research which found that we get the most vacation happiness in advance, planning and anticipating the trip. Still, like the sign, vacations don’t necessarily go as anticipated. The trick seems to be, anticipating the pleasure and dropping the burden of expectations when things go awry. So … signs … vacations … why does it matter? In 2007, when I was researching my graduate school Capstone on mediation and suffering, Polly Young-Eisendrath, author of The Gifts of Suffering, told me that we need to practice our suffering “skills” on the little things to be better equipped to handle the large grief and suffering life holds in store for all of us. The same is true for happiness. Indeed, it is largely the same skill set. I aspire to create the compassion, awareness, a mindfulness, and ability to hold onto inner tranquility during the toughest of times. Similarly, building my happiness skills around small events may allow me to be even happier when a big one rolls around — in, oh, about a month from today! That’s when my beautiful daughter is due to give birth to her baby girl. I am overflowing with expectations of joy. I imagine the birth, cuddling and kissing the baby, reading and singing to her, rocking her to sleep, etc. I mean, think of the toes, and the new baby smell! Aaaahhhh …. I am in full anticipatory mode! Other grandparents tell me that another pleasure — one they didn’t expect — is watching their children parent. Now I think of that, too. I fully expect to love watching my daughter be an absolutely tremendous mom. I expect the baby’s daddy to be sweet and loving, a joy to behold. I realize that the reality will not be — cannot be — as I envision. Ironically, I expect the reality to exceed my expectations! Additionally, there will be rough patches and disappointments. That’s okay. If something dreadful happens, the grief will be immeasurable. I can hardly bear to type these words, but I don’t think genuine happiness can be built on denial. Part of me is mindful of life’s tragedies — and, I see no reason to spend any real time there. For now, the expectations are sweet. I intend to savor them.